The Bowling Green State University Forensics Speech & Debate Program fully supports the university vision statement, embracing the “interdependence of teaching, learning, scholarship and service through an academic environment grounded in intellectual discovery and guided by rational discourse and civility”. The program adheres to the core values of “mutual respect, cooperation, intellectual and spiritual growth, creative imaginings and pride in a job well done”. Further, the program supports the mission statement of the Department of Communication. 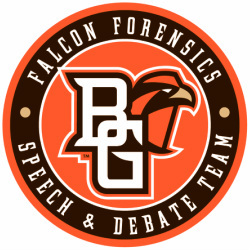 Specifically, the BGSU Forensics, Speech & Debate Program is committed to promoting communicative, creative, performance and critical excellence through undergraduate intercollegiate forensics and debate activities within a supportive learning environment. What is Forensics, Speech & Debate? The Bowling Green State University Forensics, Speech & Debate Program is a co-curricular, competitive team offered through the Department of Communication within the School of Media & Communication to any BGSU undergraduate student in good academic standing. Students, with the help of an experienced coaching staff, prepare speeches, debates and interpretive performances, competing with similar students from other academic institutions. The activity is the collegiate level of speech contests and forensics teams offered in many high schools. Participants enroll in COMM1990 (or) COMM3990 “Forensics Activities” for academic credit and are eligible for Forensics, Speech & Debate Scholarships. Team members reflect a variety of experience levels, from those wishing to advance their speaking skills, to high school champions. Participants travel to competitions around the region vying for the right to represent Bowling Green State University, the state of Ohio, the School of Media & Communication, and the team at a national tournament sponsored by one of several national forensics associations. Though material accomplishments are wonderful, the true benefits are the experience and skills gained in the process. Team members participate in 3-4 tournaments per term, choosing which tournaments they wish to attend and in which events they would like to participate. With the help of an experienced coaching staff, students develop speeches, debates and performances, refining their skills. We travel by van to tournaments hosted by sister institutions across the nation. Our program is dedicated to bringing quality forensics and debate into the BGSU campus community. Most tournaments are held on weekends with a Friday departure and Sunday return. BGSU funds entry fees, travel expenses, basic equipment and materials costs. Expenses are limited to professional attire, supplemental meals and materials used to develop speeches and performances. Each year, at the end of the season, the team attends a capstone national championship sponsored by one of the forensics or debate organizations to which Bowling Green State University is affiliated. The Falcon Forensics and Debate Team is honored to be based out of 408 Kuhlin Center, in the new School of Media and Communication building. Our state-of-the-art Forensics Complex was designed specifically for the development of student's skills in speaking, performance and argumentation. It features a team room, conference room, reception area, 3 video coaching rehearsal spaces, a performance venue, offices for the Director of Forensics and graduate assistants. Pi Kappa Delta is also housed in this new location. We are one of only a handful of teams in the nation fortuate enough to have a specifically designed space for our program. COMM1990 and 3990 “Forensics Activities I & II” are one (1) credit hour per term courses offered through the Department of Communication to nurture growth through involvement in forensic activities. The class meets weekly to discuss upcoming activities/tournaments, learn new types of events, peer coach, showcase events and discuss issues impacting the activity. COMM1990 is a practicum credit for freshman and sophomore level students and COMM3990 is for the junior and senior level student. COMM3990 includes an extra project of the student's own design. Team members repeat these courses for credit each term of their tenure as a student. What can Forensics, Speech & Debate do for me? Forensics offers you the opportunity to develop speaking and performance skills through a supportive learning environment. It affords team members the opportunity to take their public speaking, performance and argumentation studies well beyond what the traditional classroom can offer, giving them a significant leg-up in their career. You will improve group communication and interaction skills, through participation in team dynamics. Through involvement, you enhance research, critical thinking, organizational and argumentative skills. You will observe top student speakers and performers and receive feedback from leading national scholars. At BGSU, we emphasize the value of peer coaching as well as one-on-one guidance with award winning, experienced staff. The ability to effectively communicate is the number one skill sought by employers, and forensics involvement is a prized addition to a solid resume or vita. Bottom line: Forensics offers you a beneficial experience of a lifetime. BGSU offers competitive forensics scholarships recognizing dedication to, and talent in, Forensics, Speech and Debate. Application materials are available on our scholarship page. The application deadline and audition date falls in early March each year. You need not be a communication major to receive an award. In addition, through the generosity of our alumni, we annually recognize two students for their contributions with the Martin L. Hanna Family Award in Public Speaking and the Howard L. Shine Memorial Foundation Award. To which associations does BGSU belong? This, the largest association for forensics and debate competition, annually hosts the NFA National Championships in April each season. This is a national honorary emphasizing the educational value and fellowship inherent in forensic and communication activities. Pi Kappa Delta offers bi-yearly national and provincial tournaments and conventions as well as participation in a National Comprehensive Tournament held on odd numbered years. This society offers a continental championship each January that rotates between the north and south, offering an international forensics experience based in exotic locations within the western hemisphere. The emphasis is on blending the forensics and cultural experiences. This International Championship is held in a different country each year, promoting both forensic excellence through competition, but also cultural exploration. Widely attended, IFA attracts teams from all over the US and some global countries as well. This state organization governs, promotes and supports forensics and debate activities within Ohio, offering a workshop tournament in the fall as well as Novice and Varsity State Championships each February. Becoming a member of the Falcon Forensics & Debate Program or Pi Kappa Delta is as simple as contacting our office and expressing your interest. There is no audition process to participate. Forensics & Debate Program members must enroll in COMM1990 (or) COMM3990 for 1 credit hour per term, through the Department of Communication. National membership in Pi Kappa Delta is by invitation, based on participation in communication activities, forensics & debate participation or service; however, as a student organization through the Office of Campus Involvement, chapter involvement is open to all BGSU students. Pi Kappa Delta is a National Forensics and Communication Honorary, and, established in 1930, is one of the oldest and most honored student organizations at Bowling Green State University. The student organization works in conjunction with the Forensics, Speech & Debate Program and Office of Campus Involvement to provide a social/service forum, advocating communication. Membership is open to any undergraduate student demonstrating a commitment to forensics, debate or communication activities. On a bi-yearly basis, the Pi Kappa Delta National Organization hosts a National Convention and Tournament, bringing together members from across the nation for competition, discussion, networking and fellowship.